Cooking for 76 is just like for a large dinner party really. Just takes a bit more planning. 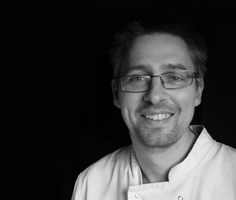 It's said that everyone who lives in Broadway has worked at The Lygon Arms at some point in their life. Geoff was head gardener there for many years, and I would often meet him as I picked things from the garden for the kitchen when I worked there. Yesterday was their daughter's wedding which I was cooking for with my team (thanks team! ), following a great birthday meal a few years before, and where else would you hold an event in Broadway but the Lifford Hall - it's the hub of village events many and varied. 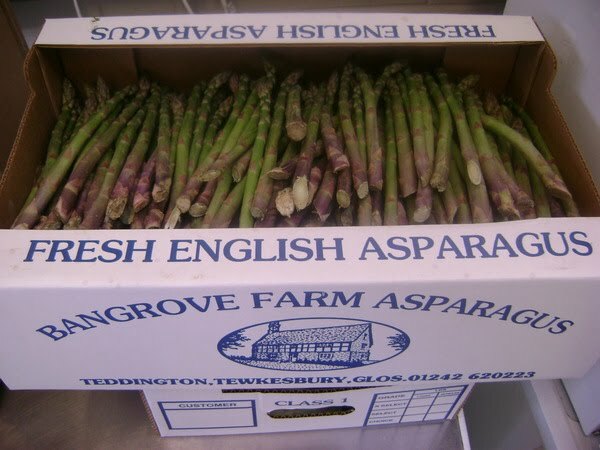 I picked up the asparagus from Teddington, just 4 miles away a few days before. As I arrived the farmer was just bringing it in from the field on the quad bike - couldn't be fresher. I sorted through it all selecting the ones I wanted while he was busy doing other things. Nothing like a bit of quality control. 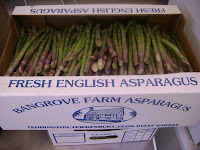 I found Bangrove by accident really - drove past the sign saying 'asparagus here' years ago, turned around and went back. Now I don't like getting it from anywhere else - there is just no comparison. Also buying it from a vegetable supplier you never quite know what you are going to get. When you can actually select your own like I did the other day it makes the whole cooking proccess much more enjoyable. "...and I was saying to Geoff last night - you must have had quite a long day" said Val, the bride's mother this morning when I was clearing up "you were there from 3 o'clock and you didn't leave till...."
"Just after 1" I finished. But of course, behind what you see on the day there is a whole 7 day industry. For it to run so smoothly on the day requires preparation - there are no second chances. I had booked the racks of lamb back with Home Farm back in November when we had agreed basic details of the wedding and been checking up every so often how it was going. Because of the price of export lamb now it makes much more sense for them to sell their lambs live at market and the meat ends up being exported. They make exactly the same amount if they send it to slaughter, then butcher it themselves and sell it in the farm shop or farmers market. Add in the transport cost from the farm to salughter and back, and there is no wonder why they are cutting back on the lamb they sell in the shop. But because it was me they were happy to do it - another reason why shopping locally is good. Because they leave the chine bone on while I was out cooking for the Saturday night party Hannah removed these and roasted them, so I could make stock on Sunday morning which formed the basis of the sauce. 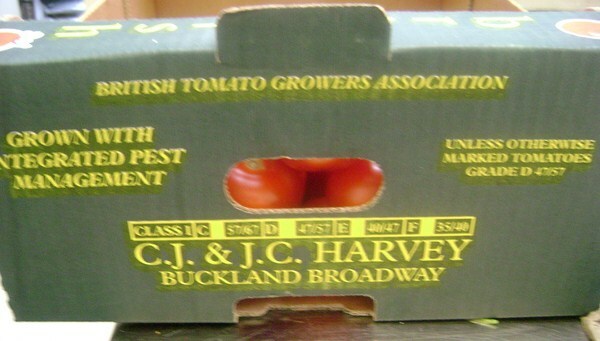 Tomatoes that were blanched, peeled and diced and added the lamb sauce and also used for tomato soup for the children came from wonderful tomato growers in Buckland - the next village to Broadway. They smelled and tasted just how tomatoes should - not what you can say for mass production supermarket tomatoes sadly - it all makes a difference in the end result. 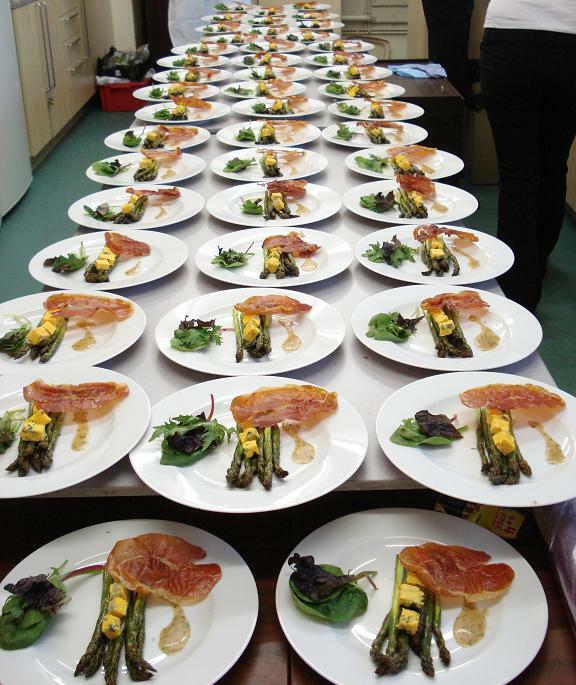 Spinach which went under the lamb was from a local farm too - Zentith Nurseries near Evesham. It's just amazing how everything comes together so quickly. The hours of 3 - 8 just dissappeared. After weeks of planning in no time at all the main course had been sent and we ploughed straight into finishing this dessert. I will add the cheesecake recipe at some point - it is one of the most requested. The caramelisation on the top like a creme brulee is the finishing touch. Link to chocolate tart recipe is here. They just need heating in the oven till soft. And while I was organising other things the @Party-Angels who had been looking after front of house so well put the raspberries on top for me. Their Homemade walnut, raisin and rosemary bread rolls made in the (not so) early hours of Thursday. That lamb looks lovely - and so does everything else! @Eyes Bigger - the best thing is you can make the chocolate tart in advance. Try adding Baileys in there as well? @Jan - lamb smelled great too as all the guests were walking past the kitchen. Everything looks wonderful. I especially, as always, like your trio of chocolate desserts. I love what you did with the lamb. Looks delicious and I'm sure the people there enjoyed what you did and they will asking for more. Bride here, the food and service was stunning. Thank you so much from both of us. Marg - thanks - those desserts are my favourite thing to do. Bec - thanks. Hope you had a nice honeymoon. Jim and Kathy Benn - parents of the bridegroom - we thoroughly enjoyed all the meal - those puddings were delicious - and the fact that local produce was used for all the courses was first class. Well done to all.